The best policy for a state (assuming it wants growth and competitiveness) is to have no income tax. Along with a modest burden of government spending, of course. The next-best approach is for a state to have a flat tax. If nothing else, a flat tax inevitably will have a reasonable rate since it’s politically difficult to pillage everyone (though Illinois is trying very hard to be an exception to that rule). Moreover, a flat tax also sends a signal that politicians in the state don’t (or can’t) play the divide-and-conquer game of periodically raising taxes on different income groups. Today, we have some good news. Kentucky has ditched its so-called progressive income tax and joined the flat tax club. The Tax Foundation has the details (including the changes in the state’s ranking). …legislators in Kentucky overrode Governor Matt Bevin’s veto to pass HB 366, a tax reform package, in the last few days of the session. 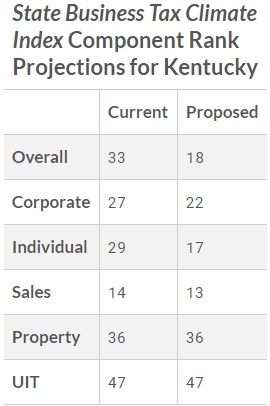 Ultimately, HB 366…increases Kentucky’s ranking on the State Business Tax Climate Index from 33rd to 18th. …Here’s how HB 366 changes Kentucky’s tax code: Replacing the current six-bracket individual income tax, which has a top rate of 6.0 percent, with a 5 percent single rate individual income tax; …Replacing the current three-bracket corporate income tax, with its top rate of 6.0 percent, with a 5 percent flat rate; …Expanding the sales tax base to include select services…; and Raising the cigarette tax from 60 cents to $1.10 per pack. …the changes in this tax reform package dramatically improve the state’s tax climate. By broadening bases while lowering rates, starting to correct the inequities in the sales tax base, and taking steps to make the state more friendly to investment, policymakers in the state took a responsible approach to comprehensive tax reform. Kentucky will have a better tax system, but there is a dark lining to the silver cloud of reform. The legislation is a net tax increase, meaning state politicians will have more money to spend (which is a variable that is not included in the Tax Foundation’s Business Tax Climate Index). As a big fan of the no-tax-hike pledge, that makes me sympathetic to some of those who opposed the legislation. But I confess that I’m nonetheless happy that there’s now another state with a flat tax. Which motivated me to create a five-column ranking for states with regards to the issue of personal income tax. 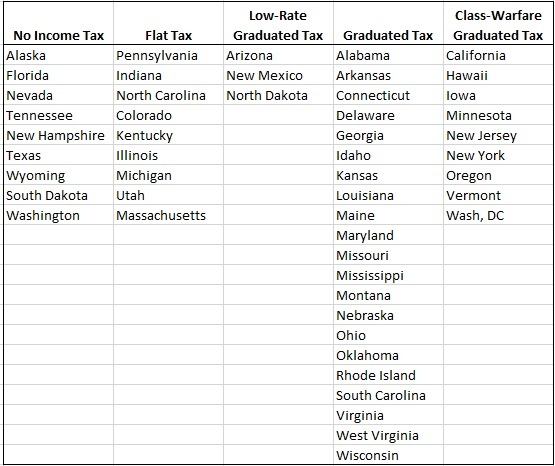 The best states are in the first column, since they don’t impose any income tax. The second-best option is a flat tax, and then I have three options for so-called progressive tax regimes. 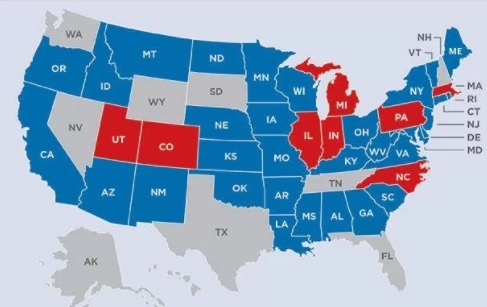 A “low-rate” state means the top bracket is less than 5 percent and a “class-warfare” state means the top bracket is higher than 8 percent (with other states in a middle group). Kentucky has moved from the fourth column to the second column, which is a nice step. Very similar to what North Carolina did a few years ago. Kansas, by contrast, recently went from the fourth column to the third column and then back to the fourth column. And I may have to create a special sixth column for states such as California.